The definitive visual history of early Eddie Van Halen! 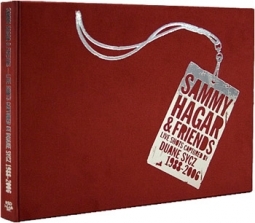 This hardcover coffee table photo book is jam packed with classic and never before published photos! 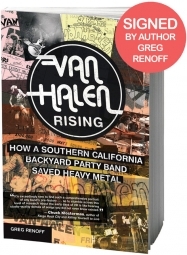 A MUST HAVE for Van Halen fans and guitarists alike! Famous guitarists who contributed text: Angus Young, Jimmy Page, Joe Perry, Les Paul, Stave Vai, Joe Satriani, Nuno Bettencourt, Ritchie Blackmore, Gilby Clarke, Phil Collen, Billy Gibbons, Peter Frampton, Paul Gilbert, Allan Holdsworth, Scott Ian, Tony Iommi, Steve Lukather, Mick Mars, Ronnie Montrose, Gary Moore, Tom Morello, Dave Navarro, Rick Nielsen, Ted Nugent, Paul Stanley, Nancy Wilson, Zakk Wylde, Dweezil Zappa, and many others. 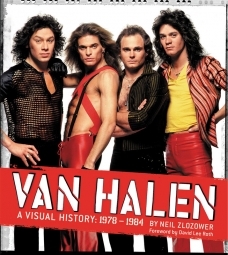 Van Halen insiders who contributed text: Eddie Anderson (director of security 1980-84), Pete Angelus (creative consultant, production/lighting designer), Marshall Berle (personal manager 1977-78), Bill Gazzarri (owner: Gazzarri's nighclub), Michael Karlin (Van Halen business manager, 1978-present), Jas Obrecht (editor: Guitar Player magazine), Patrick Whitley (production manager 1978-84) and Michael Anthony. Neil Zlozower's rock photography spans more than 40 years and includes work with The Rolling Stones, Aerosmith, AC/DC, and many others. From 1978 to 1984, Zlozower was the "fifth member of Van Halen," touring with and capturing images of the band during the David Lee Roth era. Hardcover, 176 pages, 8.5 x 11 inches, Nearly 200 color and b/w photographs. Out of print & limited supply. Order your copy of this amazing collectible today! The color in picture is so vivid and clear ,love seeing the older pics when he was a young man.. I have been a Evh fan since I was 12 .I'm 47 now I thoughtnid seen every picture of Ed printed man was I wrong plenty of never seen photos and info that was new and fresh to me. Full of great photos, and stories, too! Besides the fantastic photos, which I knew it would have, I was happily surprised by the countless interesting quotes from all the famous guitarists ... all who share their own Eddie Van Halen stories. WELL worth the money! A perfect little (no, BIG!) book about Edward.